Sculpture in Stone (MFA), no. 199; Sculpture in Stone and Bronze (MFA), p. 112 (additional published references). 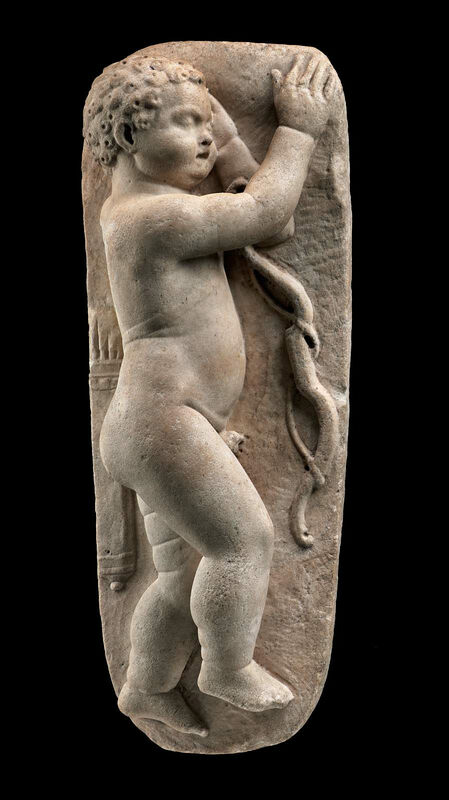 Sleeping baby Eros with his bow and quiver represented beneath him on the plinth. He uses his cloak for a pillow. A well known type in Roman imperial art that may be traced to a Hellenistic bronze prototype based on closely observed human toddler as a model; note the soft belly, fleshy thighs, squared feet, chubby face. Perhaps, used as a child’s funerary marker. The wings were restored in another marble. The surfaces are much worn and have been somewhat cleaned. The plinth on which the little god sleeps is worked roughly on its outer surfaces. The wings were also tinted a yellow-brown.